This year’s Credit Suisse’s annual global wealth report shows that once again Australians have the highest median wealth in the world, and we have a very low percentage of poor people. I’ve explained my thoughts about why we’re once again the wealthiest nation in the world here. While there are a couple of reasons for this, the main reason is the composition of household wealth in Australia is heavily skewed towards “real assets” – in other words real estate. The Global Wealth Report shows Australians have enjoyed some of the biggest gains in wealth in recent years. 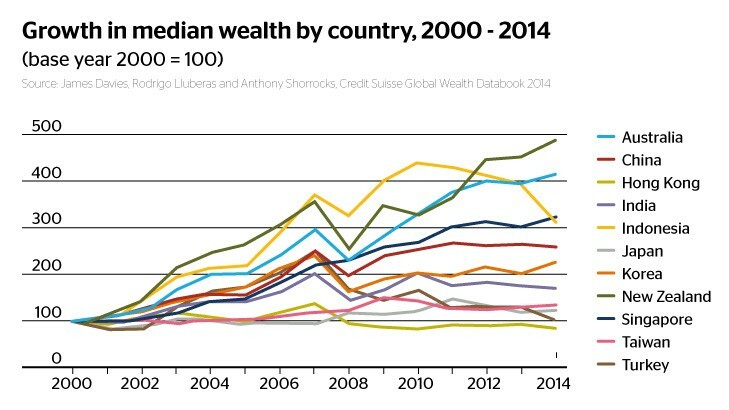 The first graph tracks trends in the median wealth of adults in different countries from 2000 to 2014. Australians achieved some of the biggest gains in the Asia-Pacific region in the past 14 years, second only behind New Zealanders. Why has Australia performed so well? 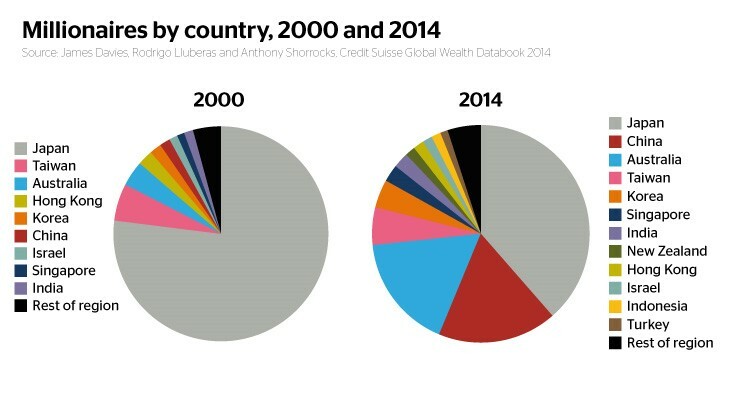 The Sydney Morning Herald explains that one of the things this graph shows is the impact of financial crises on median wealth, with New Zealand and Korea experiencing particularly large setbacks during the global financial crisis. Median wealth in Korea, Hong Kong and India has still not recovered to the level achieved in 2007. Australians suffered less during the GFC compared to their neighbours, but the pace at which their median wealth was growing before the crisis has slowed considerably in recent years. We obviously fared better during the GFC than others and our recovery has been better too. 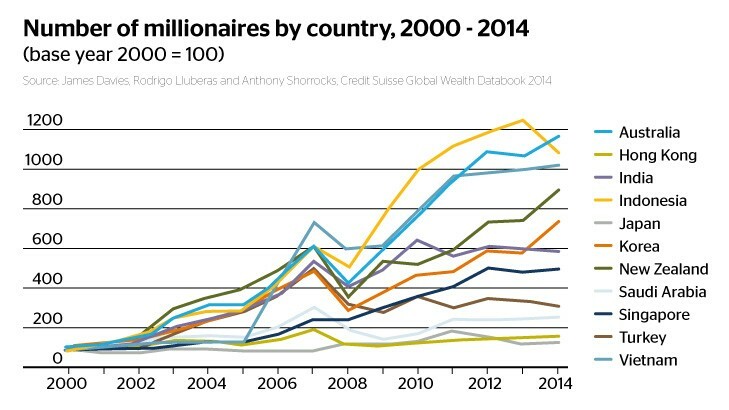 Growth in the number of millionaires in various countries. There were 1.1 million millionaires in Australia a few years ago. Now there are more than 1.25 million. But while Australians have enjoyed the benefits of a stronger exchange rate and growing house prices and asset prices, other countries have fared less well. By the way…this graph has excluded the number of millionaires in China because it is so far ahead of the rest of the region. The above graph shows how the changing fortunes of millionaires in the region have had a significant impact on the “residence pattern” of millionaires in Asia and Australia. As this graph shows, Japan had more than three-quarters of the total resident millionaires in the Asia Pacific and Middle East at the beginning of the century. But its regional share has halved to 39 per cent. China’s share has risen ten-fold to 18 per cent. Australia’s share has risen four-fold to 17 per cent. Representation in Korea, India and Singapore has roughly doubled, but the share has remained constant in Taiwan and fallen in Hong Kong. How many Ultra High Net Worth Individuals? 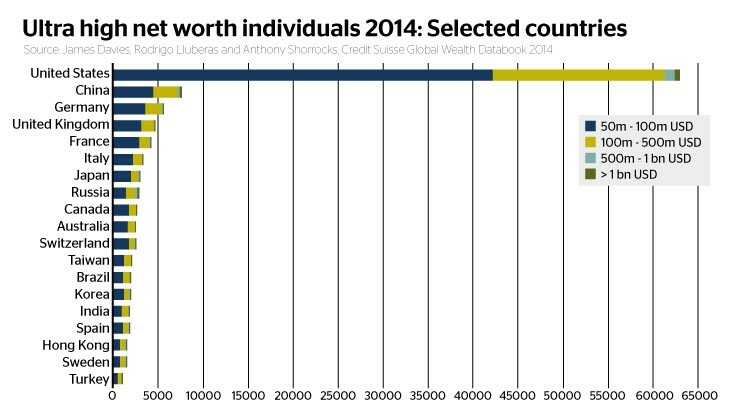 The report characterises “ultra-high net worth individuals” as people whose net worth is over $US50 million ($57.4 million) and as the graph above shows, America has plenty of them. There are roughly 128,200 ultra-high net worth individuals in the world, of which 45,200 are worth at least $US100 million and 4300 have assets above $US500 million. America clearly dominates the regional rankings. The number of high-net worth and ultra-high net worth individuals has grown rapidly in recent years, but the report’s authors say it is hard to say whether the very wealthy have “benefited most” since the financial crisis. “Little can be deduced about inequality trends from the fact that the number of millionaires and billionaires is growing faster than average wealth,” the report says.